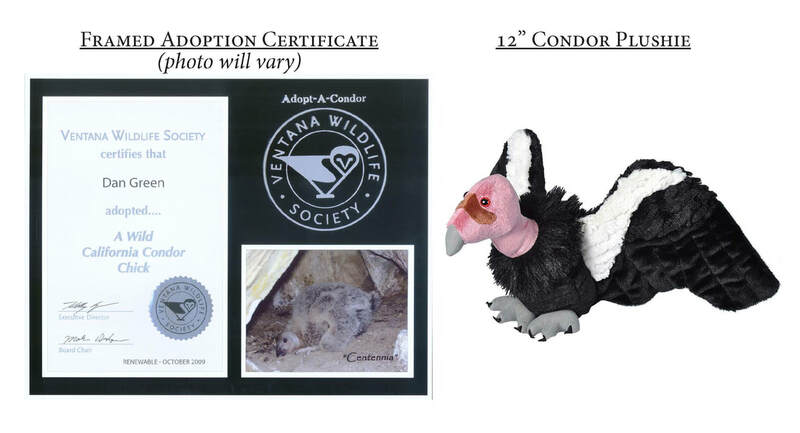 You can help us help condors by joining the ​Adopt-A-Condor program. Even though this program will not give you the joy of hauling a carcass or handling ​a condor yourself, it will give you the joy of financially contributing to these and other efforts by ​Ventana Wildlife Society biologists to protect the population. ​by the condor in the wild. Shipping Information: Domestic and international shipping charges will be applied. Delivery time and date cannot be guaranteed. Though we try our hardest to expedite your order as quickly as possible, please allow 7-10 days for U.S. delivery, and international addresses, please allow 3-8 weeks.​ For all shipments made outside the US, we will charge for actual shipping cost. About Your Donation: Your donation will be used in general support of VWS' efforts. 85 cents of every donated dollar goes toward conservation. Your donation is fully tax deductible to the extent of the law. The level of tax-deductibility depends on whether or not a free gift was selected and the amount donated. Please refer to the mailed acknowledgment letter to determine how much of your gift is tax-deductible. MAXIMIZE YOUR DONATION: If you do not want us to spend money on sending you the free gifts associated with your adoption, select "Donate without receiving Adoption Kit” when ordering. Please be aware that if you remove the adoption kit to maximize your donation, you will still receive an acknowledgment for the donation but will not receive ANY tangible items (such as the plush animal, photo, adoption certificate, etc.) associated with the donation. If you order over the phone, please tell the staff member that you would like to maximize your donation and do not want the mailed gifts. Ventana Wildlife Society thanks you for your additional commitment to our conservation efforts! ADOPT IN HONOR OF: You can give a gift adoption for a birthday, wedding, graduation, Bar or Bat Mitzvah, or any occasion you would like to honor. It is a very thoughtful way to commemorate an important day in the life of someone who cares about the future of nature. We will send a personalized letter to the notified party to acknowledge the adoption gift. If you wish for the adoption kit to go to the honored party, check the “Send kit to honored party” box when ordering. If the box is not checked, the kit will automatically be shipped to your address. The kit cannot be split up and mailed to different parties. ADOPT IN MEMORY OF: A memorial gift can be made in remembrance of a loved one who is deceased. In arranging your memorial gift, please provide us with the full name of the person being remembered, as well as the full name and address of the person to be notified about this special gift. We will send a personalized letter to the notified party to acknowledge the Memorial Adoption gift. If you wish for the adoption kit to go to the notified party with the certificate “in memory of”, check the “Send kit to notified party” box when ordering. GIVING AN ADOPTION AS A GIFT: Upon submitting your donation online, the adoption kit is processed immediately and shipped. If you’d like the adoption kit directly to the recipient, check the “send adoption kit to gift recipient” box. If the box is not checked, it will automatically be shipped to your address. We cannot guarantee shipping time frames, however estimated delivery time for mailed items to US addresses is 7-10 days; estimated shipping time frame for international addresses is 3-8 weeks. TO RECEIVE JUST THE CERTIFICATE AND PHOTO: If you do not want the plush animal (or t-shirt option) that comes with the adoption package at the $50 level and above, but would like to receive the paper adoption items, you may choose the “Certificate and photo only” option when ordering.